Pierre Garreaud is a Peruvian Sound Healer Shaman and Teacher who was born in the city of Lima, Peru. At the age of 18, Pierre traveled to the City of Cuzco for the first time. Immediately, he discovered a deep connection with the Andes and the Inca elders of his land. This connection inspired him to research and learn more about the native healing ways of his homeland. For the past 20 years, Pierre has traveled back and forth to the Andes Mountains and the Amazon of Peru to train with the well respected healers. Pierre was taught sound healing by the shamans of the Rainforest of Peru and was initiated in the Andean Cosmology Path since the early 1990's. Pierre is a Kriya Yoga initiate, he studied and follows the teachings of Self Realized Master Paramahansa Yogananda. 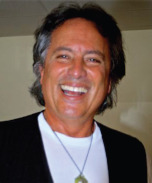 This unique combination of peruvian shamanism, yoga meditation for over 20 years and his extensive music background acquired at Berklee College of Music, clearly defines Pierre's healing and teaching work as very powerful and deeply transformational. Pierre integrates Eastern meditation, Native American healing techniques, ancient healing sounds, ritual and ceremony in honor of all living things. He is a very talented inspirational singer and has the gift of transporting listeners into high frequency dimensions allowing them to connect to the deepest parts of their Souls. By using his voice, sacred chants and unique sounds, Pierre takes participant's on many different journeys through the shamanic archetypal worlds of the Rainforest, the worlds of sacred geometry, and higher dimensions. The Twins are acclaimed in the North Coast of Peru, where they successfully practice a powerful way of working with spirit. Descended from an ancient lineage of pre-Incan female healers over 1000 years strong, they work with their Mesa and "artes" (sacred items in their mesa), as well as plants, herbs, their hands, the Sacred Lagoons of Las Huaringas, and the sacred Spirit of San Pedro as their guide. The spirit of San Pedro works with them so they can see the energetic cause of people's illness and imbalances as well as implement the cure. People travel far and wide to get healed in individual sessions and to partake in their Mesada ceremonies. They perform deep cleanses, prayers, blessing, and cures and are famous for their "angel hands". They are renowned for curing numerous terminal illnesses that were deemed incurable. The Twins' work for their community and for the sick speaks for itself. Their "miraculous" cures with terminally ill and sick clients has been so effective that medical doctors have begun studying the twins and conducting real clinical trials/studies to document how effective their treatments are. Studied by doctors, anthropologists, & ethno-botanists because of their long 30 year history of curing "incurable" condition with natural methods, they have been featured in Dr. Bonnie Glass-Coffin's acclaimed book, "The Gift of Life", Rainer Bussmann & Dr. Douglas Sharon's book Plants of the Four Winds and on numerous documentaries, including the Discovery Channel documentary "Secrets of a Moche Tomb". The Twins knowledge of ancient female healing techniques contributed to one of the greatest archaeological breakthroughs in pre-Incan Moche culture regarding the incredible tombs discovered near the pyramid of the sun and moon on the North Coast of Peru.